Fresh Chili Powder, Made At Home, Fresh! Do you like chili powder? Do you use it all year? We love chili powder, not just to make chili but in sauces, dressings, as a meat rub and sometimes as a rimmer for a cocktail. Americans generally know chili powder as a blend of powdered chili's and spices. Chili powder could be spicy but usually not. You probably have no real idea of how old your store bought chili powder is or how it tasted when it was fresh. 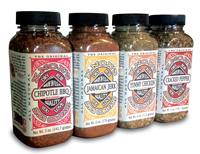 If you like your store bought chili powder you are in for a taste bud awakening. Home made chili powder is an intense flavor. Since you are making it yourself you can spice it up as you see fit. Think about Paprika. Do you know what it tastes like or even smells like. Paprika is a red bell pepper that has been dried out and ground into a powder. It looks good on a deviled egg but most of the flavor and smell is gone. A dried chili pepper freshly ground smells and tastes of pepper. Smoky and rich with flavor and aroma. Since there are several varieties of peppers that are not hot, you can make a blend that has the sweet earthy flavor and aroma with out the scorching heat. Think about that on a deviled egg. Fresh chili powder may be a very big surprise to you as it is very different from what you purchase in the grocery. Our favorite thing about fresh chili powder is you can make it as hot (or not) as you like. To add a rich, almost chocolate flavor, you can toast the chilies before grinding them into a powder. You can also add salt, coriander, cumin or just about anything to make your chili powder your own. One thing you will need is a small coffee grinder. You can purchase one at any store such as Sears or Target and cost about $25 U.S.. Krups Fast Touch Coffee Grinder is a good one. We have two, one for coffee and one for spices. You will learn fairly quickly no matter how well you wipe out your coffee grinder you will taste whatever you ground up last. Cayenne and Cumin coffee is really horrible. Buy a coffee grinder just for spices. Also it is necessary to have access to dried whole chilies such as Ancho, Pasilla or Cascabel. There are many varieties of dried chilies available at your local Mexican Market. Pull the stems off the dry chilies and take out the seeds. Tear them into pieces so they fit into your coffee grinder. Grind them into a fine powder. Mix together with the remaining ingredients. Your done, fresh chili powder. As mentioned earlier you can add an almost chocolaty flavor to your chili powder by toasting the peppers. This is done by taking a dry skillet and heating it up. Place your dry chilies in the skillet and allow them to toast until you see a bit of smoke or begin to smell them. They will turn a a bit darker or maybe even brown or black in areas. Remove them from the skillet and allow to cool. Remove the stems and seeds and grind into a powder. You will immediately smell the difference. Below is a guide to some available chili peppers sorted by heat. We typically make chili powder with mild peppers. If we need some heat we will add a bit of cayenne, but sparingly. The flavor of a chili is deep and wide and heat is just heat. You can ruin a tasty chili powder with to much heat. One of the best uses for a fresh chili powder is to season chicken or pork. Fresh chili powder with a little sage in it is excellent on chicken. Also let us not forget making chili. You may never have chili so good as the chili that uses your fresh chili powder. Below is an excellent recipe for Western Style Chili you will claim as your own and your friends will love you for it. Mix first 12 ingredients in a bowl. Heat the oil in a pan large enough to hold everything, a five quart pot might do the trick. Just as oil starts to smoke add the meat and 4 tablespoons or so of the seasoning you mixed earlier. Stir frequently until meat begins to brown. About 4 minutes. Add the red, green and pablano peppers along with the onion. Stir every couple of minutes, for 8 or 9 minutes, scrapping the bottom and sides as necessary. Add the flour and a cup of the beef stock and stir vigorously. Add the beans, juice and all. The rest of the stock, the rest of the chili powder and the bay leaves. Simmer until it is the consistency of chili.Serve with chopped onion, a splash of Tabasco and a cool beer. Add a bit of your fresh chili powder to salt and make a tasty rimmer for a Bloody Mary or Margarita. If you have any ideas for chili powder please write and we will post your idea for everyone.